People often ask me to post juicing recipes. Honestly, it’s not all that high tech. You can’t go wrong really juicing greens and vegetables. For me, juicing is a way to maximize my greens. I try not to miss a day and double up whenever I can. The healthiest and most energetic eating lifestyle for me to date has been that of the raw vegan diet. Here I was juicing, making smoothies, eating fruit, salads, nuts, seeds and dehydrated food items like granola and crackers. And of course… let’s not forget my ultimate mental fulfillment with raw vegan desserts. It was complete. Juicing was a major element though- a wonderful opportunity to bulk up on micronutrients. 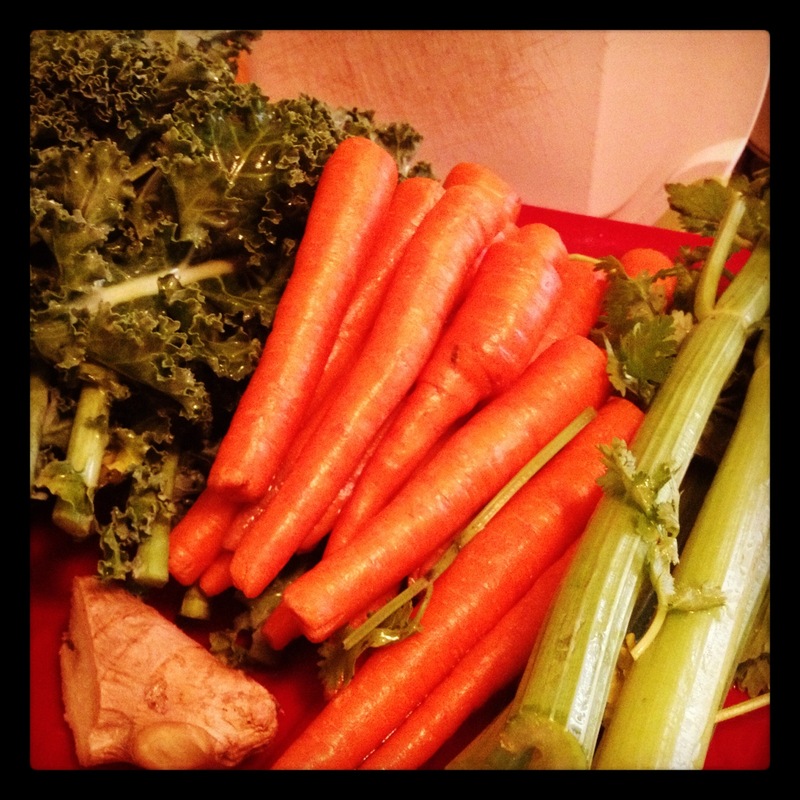 My favorite foods to juice are KALE-CARROT-APPLE-BEET. I will often supplement and experiment with other greens as well such as spinach, collard greens, swiss chard and dandelion. I like to use celery and cucumbers too! I will often add ginger and a peeled lemon for that extra pizzazz! Ginger is a wonderful world renown spice added to many recipes both raw and cooked. Ginger is one of the “trinity roots” in ayurvedic cooking. Onions and garlic are the other two. You can juice these too but experiment wisely. I also enjoy juicing other spices or herbs – my all time favorite for it’s richness in nutrients is parsley. Whenever possible, include parsley in your juicing, salads, wraps, soups and other meals. I juiced a big bunch of cilantro thinking it was parsley. Of course they look alike and they are generally located next to each other in the grocery stores. Cilantro however, has a much more distinct smell and flavor. After preparing this juice, I was quick to blame the large amount of ginger that I used for the powerful taste. In the end though I will say it was the cilantro. I had to man up and drink it! Cilantro is another of my favorite herbs with amazing qualities so I wasn’t about to turn my back on her now! I did it- I drank about 32 ounces of this in two separate servings. It’s best to drink your fresh juices right away for freshness and to maximize the enzyme and antioxidant power, however, everything is relative. It’s better to make extra and drink it later or the next day than to NOT drink it at all! I recently heard that cilantro has mood lifting properties. I researched it a little bit further and found this website GLOBALHEALINGCENTER.com listing the many benefits. Mood lifting was there! That alone and the delicious flavor makes it a wrap… literally!